ePublishing Knowledge BaseePublishing Knowledge BaseePublishing Knowledge Base Creating, Managing, and Selling Products How do I create product bundles? 1. In your product in the Product Manager, select Bundles under Edit. Zoom: In your product in the Product Manager, select Bundles under Edit. 2. Name your Product Bundle, add a Headline and assign IDs, if desired. Zoom: Name your Product Bundle, add a Headline and assign IDs, if desired. Add a teaser. You may use HTML or edit in the WYSIWYG editor. 3. Add products to your bundle by clicking on "Search for products." 4. Select the products you'd like to include in your bundle and click Confirm Selection. Do not click on the product links. Zoom: Select the products you'd like to include in your bundle and click Confirm Selection. Do not click on the product links. Do not include the product you are currently editing. It will automatically be included in the bundle. 5. Select Create a Bundle. To remove a product, click Remove. 6. Your bundle is not yet published. 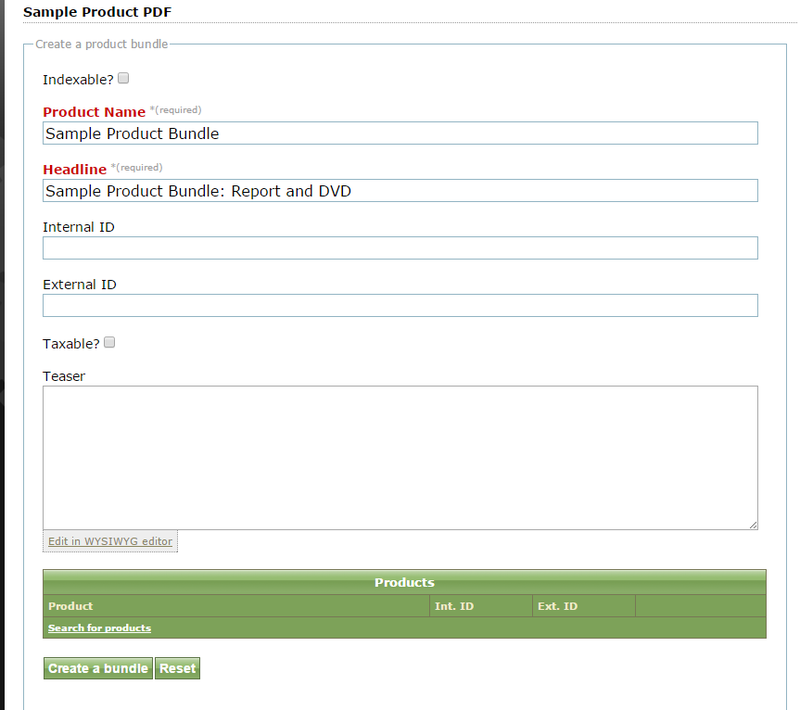 To edit and publish your Product Bundle, click the bundle name. Zoom: Your bundle is not yet published. 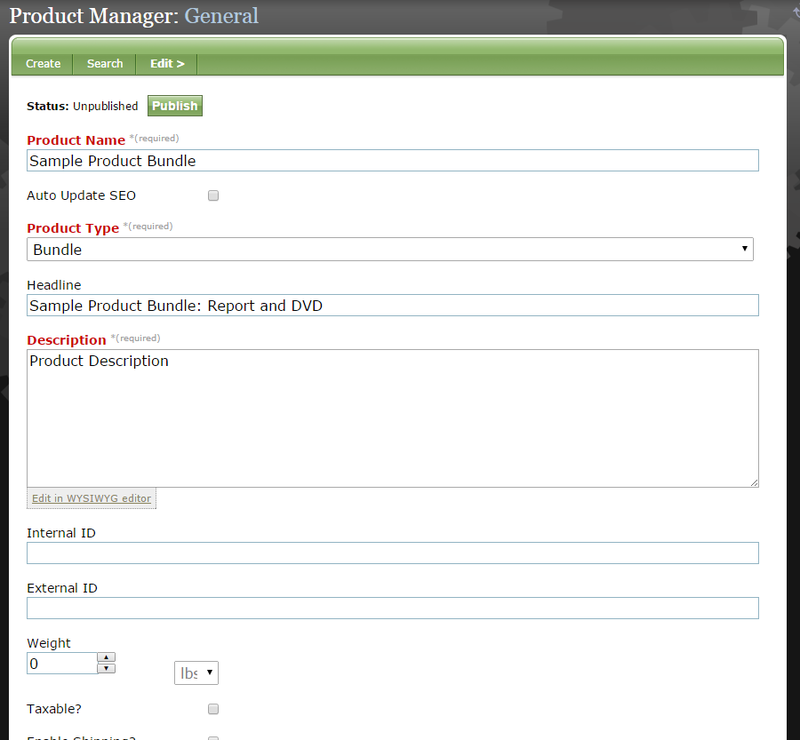 To edit and publish your Product Bundle, click the bundle name. To remove products from the bundle, click Disassociate on the right. 7. Edit your Product Bundle as a standard product. Zoom: Edit your Product Bundle as a standard product. Learn more about setting up products in: How do I create a new product? The only required field is Cost, which is the price of the product. You may also add an Orig. Cost, which would allow you to display a discount. For example, if the Orig. Cost is $10, and the Cost is $9, the product page would show a 10% discount. 9. If you want to offer a volume discount - pricing based on quantity purchased - set a minimum and maximum quantity, as well as the cost. Add a description for that pricing tier. 9.1. Add an additional pricing tier by clicking Add more on the right. Providing more than a single pricing option based on a minimum / maximum quantity and cost is optional. Doing this allows you to provide a discount for site visitors who are buying in bulk by providing them a volume-based discount. 9.2. Add the details for that pricing tier. 9.3. To delete a pricing tier, click Delete on the right. 10. When you are finished, Publish your Product Bundle. Prev: How do I add sales tax? Next: How do I create product variations?